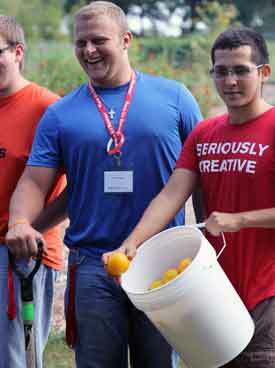 Wabash freshmen put a little muscle power to work Wednesday morning improving the Montgomery County community. 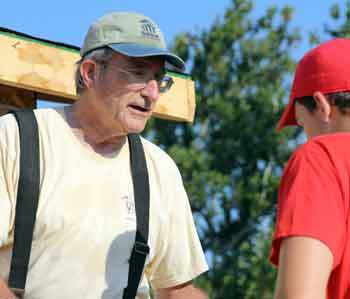 The annual Freshman Orientation Day featured 245 young men serving local charities. Farther form the center of town, a group of freshmen in Economics Professor Joyce Burnette’s tutorial group were harvesting vegetables and weeding the community garden. After the morning work the mostly red-clad freshmen made quite a sight in downtown Crawfordsville. Before splitting up for lunch at several downtown restaurants, Mayor Todd Barton ‘00 welcomed the guys to Crawfordsville. Professor Deborah Seltzer-Kelly’s students joined Hezekiah Eibert ’15, the College’s Sustainability Intern through Sodexo this summer, for “Garbology”—a morning of sorting through trash collected from college offices with the goal of improving their rate of recycling. 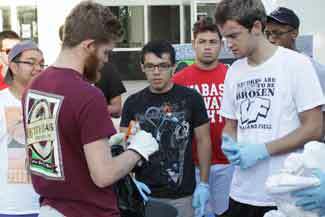 Ebert has created and is helping to put in place a program that will increase recycling and reduce waste campus-wide. “I spent much of my summer learning what is recyclable, what is not,” Ebert told the freshman, who followed his instructions and spent about an hour going through 35 bags of trash. Removing the recyclable material, they were able to reduce the number of bags going to the trash to two! The recyclable material was taken to the art department, where Professor Stefani Rossi plans to create a work to further educate the campus about recycling. Completing their sorting, the freshman toured Crawfordsville’s Walden Recycling. Student workers in the College Media Center prepared a video about Garbology.